Human Dominoes - Brighton technical school, Victoria, Australia. Brighton Technical School, Human Dominoes Record. Brighton Mayor Cr. 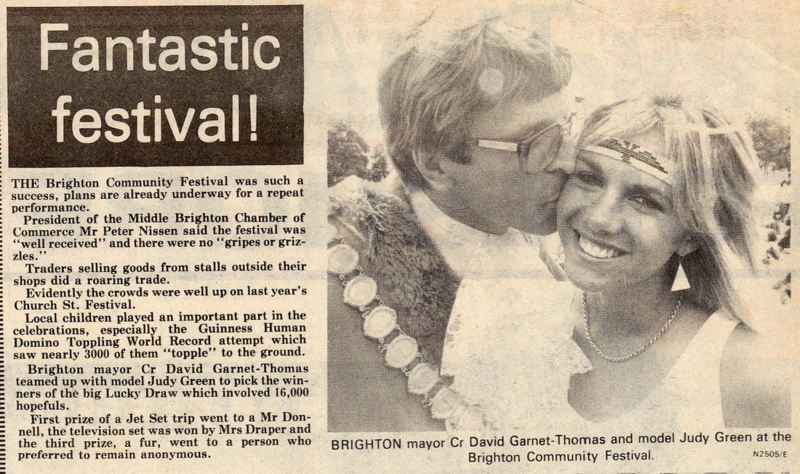 David Garnet-Thomas with model Judy Green at the Brighton Community Festival. This Event was held at Brighton Technical School, Cochrane Street, Brighton, Victoria. The "News Advertiser". Brighton, Hampton, Sandringham, Black Rock, Beaumaris. ​Wednesday, March 7, 1984. Page 2. The Brighton Community Festival was such a success, plans are already underway for a repeat performance. President of the Middle Brighton Chamber of Commerce Mr. Peter Nissen said the festival was "well received" and there were no "gripes or grizzles." Traders selling goods from stalls outside their shops did a roaring trade. Evidently the crowds were well up on last year's Church St. Festival. Local children played an important part in the celebrations, especially the Guinness Human Domino Toppling World Record attempt which saw nearly 3,000 of them "topple" to the ground. ​Brighton Mayor Cr. David Garnet-Thomas teamed up with model Judy Green to pick the winners of the big Lucky Draw which involved 16,000 hopefuls. First prize of a Jet Set trip to a Mr. Donnell, the television set was won by Mrs. Draper and the third prize, a fur, went to a person who preferred to remain anonymous." ​“Seaspray” the Magazine of the Brighton Technical School, 1984. The World's Record : Human Domino Attempt. This day didn’t begin as any other would. There was an air of confused excitement. Many BTS students knew there was going to be an attempt at the Human Domino World Record, though many didn’t actually know what the full details of the event were. All the boys knew Judy Green (television celebrity) was coming and were very excited by the prospect of just that. The first thing that began to stir interest in the event was when a giant strawberry flavoured Big M inflatable carton was erected on the oval. At around one o’clock buses and equipment began arriving at the Cochrane Street entrance. Primary students, (all aged under 13) started arriving from twenty-five different schools, the furthest being Blackburn and were directed on to the oval. Slowly, these students formed a large spiral covering the central part of the oval. Several cameramen from leading television stations arrived, one station even brought along a high access truck (like those used for SEC purposes) with a cameraman in the basket. Each student knelt at arms length from the person kneeling in front of them. The Mayor of Brighton arrived in his regalia and ‘coup de ville’ to wish the students luck and thanked all those others organizing the venture. Many spectators were arriving to see the Event, mostly parents, teachers and odd passersby. Overhead media helicopters hovered and then the main organizer fired the starting pistol and all systems were go!!! The tumbling of the human dominoes began on the far side of the oval. There were approximately four spiraling rows of students. One by one they collapsed in sequence, not unlike dominoes though more flexible. Some hesitated when pushed by the person behind, others collapsed immediately, eager to pass on the motion. Brighton Tech, Star of the Sea and Firbank students made sure that everything ran smoothly, whilst cameramen raced back and forth catching the action on film. It took around five minutes to complete the spiral toward the centre. When completed the organisers announced over the PA system for all those participating to stay prone, looking like a defeated army, while officials photographed the conclusion. “It’s over”, the MC announced. All the students jumped up in an uproar, balloons were released and soared skywards towards the helicopter. All primary students participating received a BIG M from several helpful BTS students and an underdressed Big M girl. The final event of the day was an open air drumming exhibition and all the students set off home with the satisfaction of a record well-broken. Brighton Technical School, Human Dominoes Record, Students with Mayor of Brighton. February, 1984. Leader Collection. Kingston City Council. Main Author : Wayne Smith. Mayor of Brighton, Cr. David Garnet-Thomas. Event held at Brighton Technical School, Cochrane Street, Brighton, Victoria. Brighton Technical School, Human Dominoes Record. Model Judy Green with the Mayor of Brighton, Cr. David Garnet-Thomas. February, 1984.